I read a few family food blogs. I read them for inspiration but more for admiration. I love looking at the perfect little lunches they serve their small people. They use shapes to create cute sandwiches and add little notes and flags and smoothie pouches and turn them into crazy scenes and wild animals. I love that stuff. I don’t do that, though. What I do is put together foods I know my little person loves. It looks similar every time, but she doesn’t seem to mind. When reading these blogs I have noticed that they get a lot of criticism around the ingredients they use (organic is too expensive, non-organic is unhealthy), or the quantities (too much food or not enough food), or not covering all the food groups. I’m not a nutritionist. 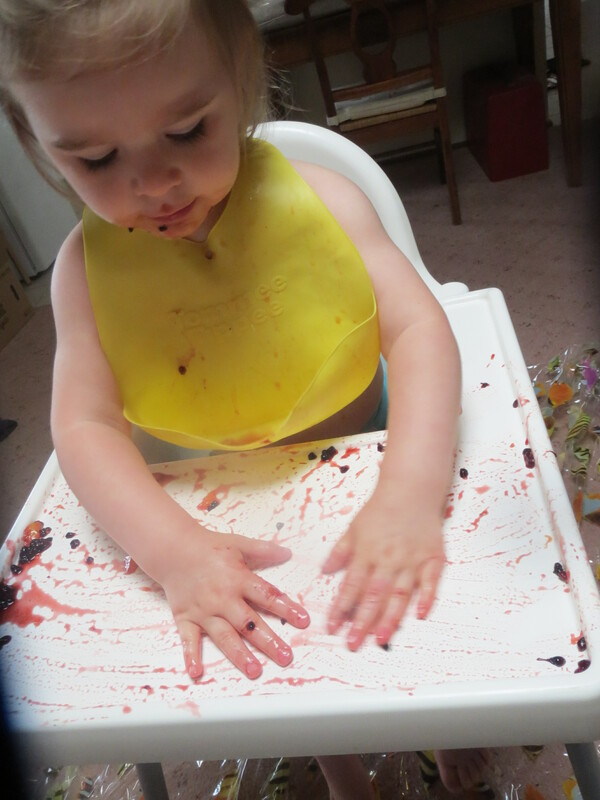 I’m just Mama Fearse, setting out to feed Little Fearse food she loves that is mostly healthy and nutritious. Every one of these lunches also comes with a bottle of water and a smoothie (usually banana or mango if it’s in season). Our last post, 30 days of Day Care Lunches for a 12 Month Old has been our most popular by about 1000 views. 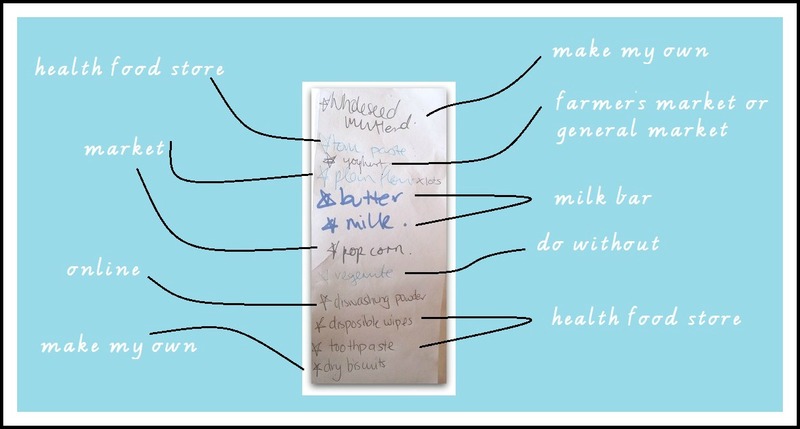 Parents out there are looking for ideas for food to feed their kids. I hope our new list gives you some new inspiration. TOP ROW: 1. Popcorn & cheese, cherry coulis & plain yoghurt, veggies & home made hummus, summer fruit salad, 2. Pumpkin muffin, veggie & cheese salad, pikelets with strawberries, nectarine, 3. Boiled egg, tuna and butter bean salad, yoghurt apricot balls, blueberries & plain yoghurt, twirly apple, frozen peas & steamed carrots. MIDDLE ROW: 1. Chicken & bacon casserole, apricot, whole meal wrap, steamed carrots, 2. Apricot and kiwi fruit salad, berries in plain yoghurt, pop corn, papadams, 3. Close up of the twirly apple. BOTTOM ROW: 1. Steamed asparagus, home made chicken nuggets, 2. Frozen peas and fresh tomatoes, egg and bacon pie, papadums and summer fruit salad, 3. 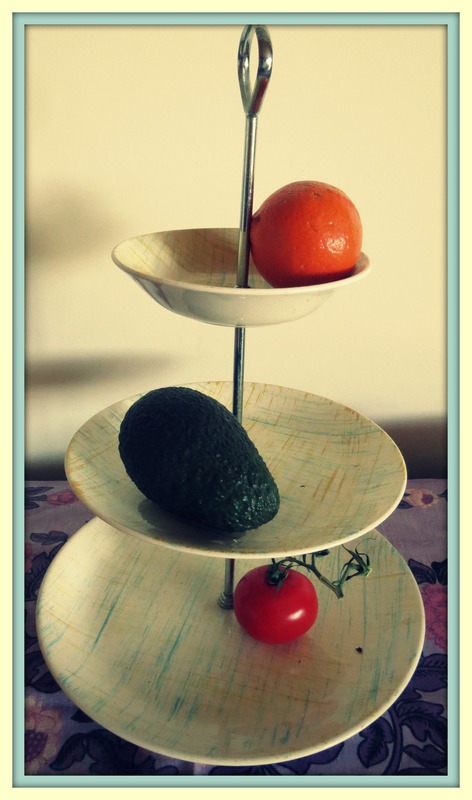 Guacamole with capsicum, organic corn chips, pumpkin muffin, blueberry and sweet lemon salad. Left over roast meat and veggies in a wrap. Home made dips with broken up wraps or veggie sticks (or papadams or biscuits or whatever) – one of the big changes since our last entry is that LF now has the motor control to manage a spoon or dipping foods into other foods. I’d love to hear from you, too. 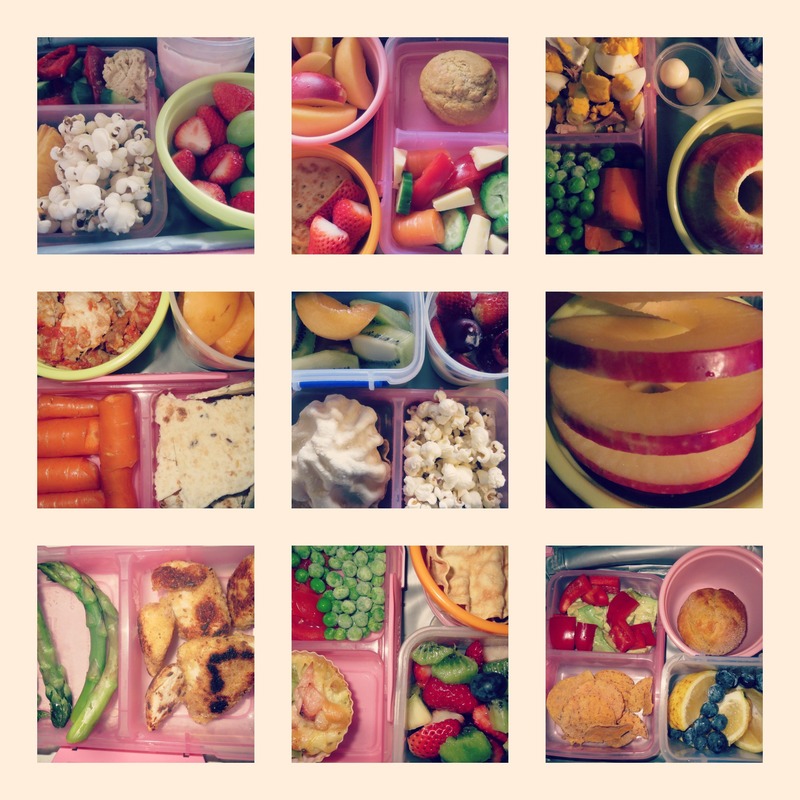 What do your kids love in their lunches? What have we forgotten, or not thought of yet? 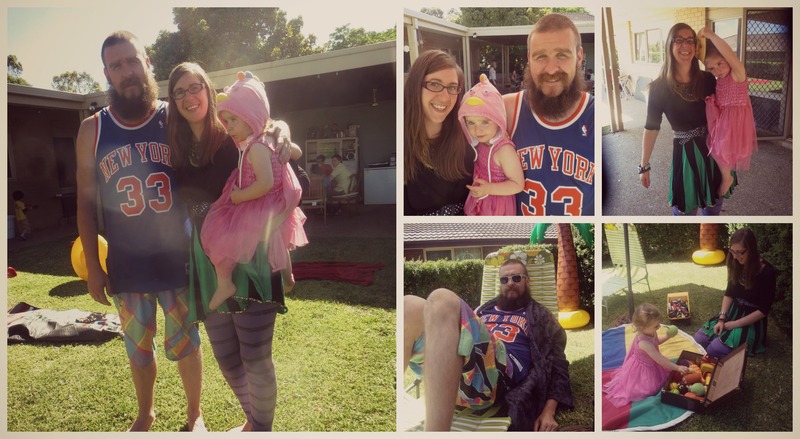 Last weekend we held a “thank you’ op shop themed BBQ for our friends who have supported our Buy Nothing New journey. Every time someone takes the time to talk to us about our Buy Nothing New lifestyle it is really touching to us. When people ask questions, or tells us we’ve inspired them to make a change it helps us to feel that we have made progress and that our small contribution is worthwhile. We invited our friends to wear something silly or serious they’ve picked up second hand along the way. Many came in outfits that included second hand items – handed down hats, pretty brooches and bright blazers. And then there were our friends who came dressed entirely in op shop outfits and looked both fabulous and fun. We had a great time choosing our own outfits. BP found most of his outfit (robe and boardies) at our local second Savers. The jersey was purchased second hand at a Brooklyn flea market. I found my dancing costume (great for spins with Little Fearse) at Savers, too. Little Fearse’s princess dress and chicken hat were a lucky St Vinnie’s find that I thought were ridiculous. Little Fearse thought they were BRILLIANT. I tried them on her for size one day earlier in the week and she refused to take them off, chucking a spectacular tantrum when she had to have a shower that evening. She knows what she wants, our daughter. I finally felt like I found my food mojo on Sunday. We planned a simple meal of local meat and a few simple salads plus barbequed veggies and corn. That week a few great recipes popped up in my feed from Mamabake and I added those to the menu. I cooked from the time I woke up until the time we all sat down to eat and I was happy with all the food we provided. I feel like it was a bit of a foodie break through for me. The best of all was where most of the food came from. It was really something to be able to serve local or home grown foods to our guests, showing that our food habits really have changed in our first BNN year. I was also able to offer guests Emma’s beetroot chutney, Tanya’s onion relish, Dad’s & my pickled lime, Dad’s quince chutney, local green tomato chutney and the Wedderburn Community tomato sauce. The eggs were local (bought at the market) and the meat was from a butcher who is now selling at the market and sources his meat from local(ish) farms with good practices. Almost all the other veggies were from a local grower who sells at the market. The fruit was also bought at the market, but not locally grown. Our gorgeous Barb made a passionfruit sponge to go with our fruit platter. It was the crowd favourite – who can resist a perfect passionfruit sponge? I really want to get our own veggie patch underway this year. I’m quite overwhelmed by the thought of starting it off, as I’ve had little success with growing anything in the garden previously. In fact, I had to hide three pots of dead plants before our guests arrived on Sunday! I have an old bath and bricks donated from a friend to create a raised bed, probably at the back of our BBQ area, where there is a lot of sun. Any tips or tricks (or good starting points) much appreciated. I’d love our next celebration to include foods from our own garden. Thanks to all of you who were not able to come on Sunday, too. Every comment or view gives us a thrill! First day of summer holidays. This week I have had a touch of gastro. It’s never pleasant, but neither is it the worst case I’ve seen (or experienced). The thing that has got me is the absolute lack of desire to look at food, think about food, plan meals etc. It’s so hard to care about food when you’re sick, and this coupled with the guilt that I should care about food for Little Fearse all the time has made me feel quite glum. In honesty, for weeks now I’ve felt really blah about food. I work really hard to provide Little Fearse with balanced meals at all the right times through out the day. I love thinking up new awesome ideas for her day care lunches. I peruse recipes like they’re going out of style (many of them probably are) and ear mark pages, fill books with tabs, write lists for shopping and plans for menus. I’m just not following through at the moment. What do you do when the food doldrums kick in? Do you go into ultra organised mode? Do you buy more convenience food? What are your easy go-to meals? I’d love some advice that could help drag me out of this cooking rut.